Bicep tears are painful. They can really hurt, especially if they happen in the middle of an activity or workout. We hear about them all the time while watching things like baseball or professional wrestling, but what exactly is a bicep tear? Can you heal a torn bicep naturally or is surgery involved? Consider this article your beginner’s guide to a bicep injury. Below, we will discuss strained biceps, bicep tear symptoms, bicep tear treatment plans, bicep tear recovery, and bicep tendon tear exercises. We’ll cover all of the basics about bicep injury and what you will need to do to recover from it. 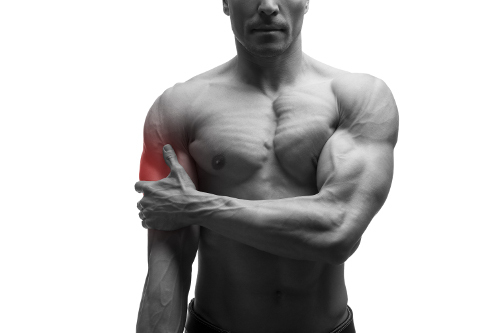 What are the Causes and Symptoms of a Torn Bicep? First, you need to know what a torn bicep is. A torn bicep can mean a couple of different things. Often, this refers to a torn tendon that connects the bicep muscle to the arm. The tendon usually tears around the elbow. The other form of bicep tear occurs when the muscle itself has torn. As for what causes these tears, it’s pretty basic stuff. A torn bicep can be caused by an injury to the arm. This can be the result of a direct hit to the arm or too much strain on the arm from weight, causing the tendon or muscle to tear. Lifting too much weight or lifting a heavy weight can cause a bicep tear. Loss of strength in the arm. Difficulty when trying to bend the elbow and or issues rotating your forearm outwards. If this happens, the next step is to head to a doctor for a proper diagnosis. You think you may have torn your bicep in one way or another, and you’ve made your way to a doctor to properly diagnose the problem. In the case of a torn bicep, X-rays are not much help, with the exception of ruling out a cracked elbow. X-rays can’t really show a tendon or muscle tissue even if it’s torn. In terms of technology, the doctor’s best bet is an ultrasound or an MRI. For a physical examination, the doctor will look for a gap between the tendon and the elbow as well as test the strength of your arm. The doctor should also examine other signs of a torn bicep like a bulge in the upper arm. Now that you have your arm diagnosed, the hard part begins. The doctor has diagnosed your bicep and, unfortunately, all of your suspicions were true; you’ve torn your bicep. The next thing you have to do is figure out which path to recovery you have to take. Will you be able to recover with rehab and rest or is it more serious and will you need surgery? Non-surgical recovery may be an option if the tear isn’t too bad or surgery for the patient isn’t an option due to age or religious beliefs. This option requires the limited use of the injured arm, anti-inflammatory medications to help with the swelling and pain, and after a stretch of time, physical rehabilitation. For many, surgery will be the only choice, especially for those who are active. Surgery is often done in the first two to three weeks of the injury as waiting much longer can result in the formation of scar tissue and the shortening of the tendon, which could limit mobility in the arm. After surgery, you will need to rest the arm for several months before engaging in full activity or sports. But there will probably be physical rehabilitation in your future. Once your bicep is fixed up, you will probably want to jump back into exercising or sports again, but there are a few things you should keep in mind. Take it slow. Your arm is going to take a bit to heal up and get back to its normal self. Take exercise and activities involving the arm slowly. When progressing your exercise regimen, you would normally increase weights or reps after a certain period of time. When you do increase them, do not increase the activity by more than 10% per week. For the first while and until your arm is totally healed or you are comfortable, wear arm protection when playing a sport. The last thing you want to do is re-injure the bicep. Wrist Rotation: Holding a light weight in one hand, turn your palm up to the ceiling, and then down to the ground. Repeat these movements on each side, three sets of 10, every other day. Biceps stretch: Facing a wall (about six inches, or 15 centimeters, away from the wall), raise the injured arm out to your side. Place your hand against the wall (palm down) and keep your arm straight. Rotate your body in the opposite direction of the raised arm until you feel a stretch in your biceps. Hold 15 seconds. Repeat three times. Biceps curl: Holding a 5 to 8-pound weight in your hand, stand up. Bend your elbow and bring your hand (palm up) toward your shoulder and then hold that curl for five seconds. Straighten your arm out slowly and return to the starting position. This works best as two sets of eight to 12 reps. Active elbow flexion: Bring the palm of the hand on your injured side up toward your shoulder slowly and gently. Bend your elbow as much as you can. Straighten the elbow as far as you can and repeat 15 times. Two sets of 15 is advised. Shoulder internal rotation: For this exercise, you will need some exercise tubing. Stand next to a door with your injured arm closest to the door. Tie a knot at the end of the tubing and shut the knot in the door at waist level. While holding the other end of the tubing with the injured arm, bend the elbow of your injured arm at 90 degrees. Keeping your elbow in at your side, rotate your forearm across your body, and then slowly move it back to the starting position. Make sure you keep your forearm parallel to the floor. Do two sets of eight to 12. Side-lying external rotation: Lie on your uninjured side with your injured arm at your side and the elbow bent approximately 90 degrees. Keeping your elbow against your side, raise your forearm toward the ceiling. Hold it there for two seconds. Slowly lower your arm. Do two sets of 15. Start doing this exercise with a light weight and gradually increase the weight as long as there is no pain in the previously injured arm. The thing to remember about all of these exercises is to take it slow, especially when you first start doing them. If it hurts, stop immediately. If this pain continues, consult your doctor and possibly work out a better exercise plan for your injury. As you have probably figured out, bicep tears are not a fun type of injury. It’s painful, and can require surgery, months of inactivity, and a slow road to recovery. The two important things to remember are to get it diagnosed as soon as possible and take your recovery slowly. If you think you’ve torn your bicep if it fits the symptoms we previously mentioned, get a doctor to take a look at it. The longer it takes to fix your torn bicep, the more likely you are to suffer internal damage. Rushing your recovery could possibly lead to re-injury and then you’re starting all the way back at square one. Follow these tips and you should be back up to full strength. “Biceps Tendon Tear at the Elbow,” OrthoInfo; http://orthoinfo.aaos.org/topic.cfm?topic=a00376, last accessed March 29, 2017. Kolomycki, A. “Torn Biceps,” Paramount Sports Recovery; http://paramountsportsrecovery.com.au/torn-biceps-symptoms-and-treatment/, last accessed March 29, 2017. Brown, J., “The Complete Guide to Torn Biceps,” Exos, March 14, 2013; http://www.coreperformance.com/knowledge/injury-pain/the-complete-guide-to-torn-biceps.html, last accessed March 29, 2017. Dunham, D., “Healing a Torn Bicep Muscle,” Livestrong, August 16, 2013; http://www.livestrong.com/article/21577-healing-torn-bicep-muscle/, last accessed March 29, 2017. “Biceps Tendon Injury Exercises,” Summit Medical Group, http://www.summitmedicalgroup.com/library/adult_health/sma_biceps_tendonitis_exercises/, last accessed March 29, 2017.